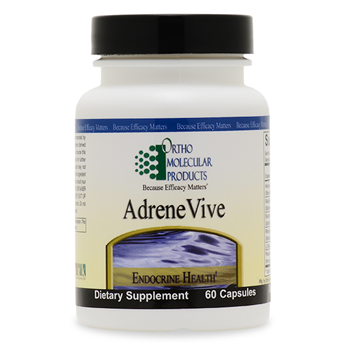 AdreneVive is a blend of adaptogenic botanicals and nutrients specifically formulated to counteract the effects of daily stress and support healthy energy levels. An amino acid found abundantly in green tea. L-theanine has been shown to quickly improve stress perception and resilience. The stress-buffering mechanisms of L-theanine have been connected to the ability of L-theanine to increase serotonin and dopamine production in the brain. L-theanine has also been shown to significantly increase alpha brain wave activity, which is critical for increasing attention as well as promoting a sense of relaxation. In a study using 16 healthy volunteers, electroencephalograph (EEG) readings of participants were recorded following the ingestion of 50 mg of L-theanine. The researchers found a greater increase in alpha brain wave activity versus placebo. L-theanine has also been shown to have a protective effect for nerve cells and reduces excitatory glutamate activity in the brain. It's strong adaptogenic properties provide an array of benefits for individuals with compromised health due to extreme stress exposure. Ashwagandha's benefits include improving stress resilience, supporting immune response, regulating the sleep cycle, supporting healthy thyroid function and protecting against exhaustion of the nervous system. Ashwagandha has also been shown to be beneficial in supporting proper mood regulation and restoring a sense of calmness under stress. Has been categorized as an adaptogenic botanical due to its ability to increase resistance to a variety of stressors. Rhodiola has been studied extensively and is widely used in Eastern Europe and Asia to help support the nervous system, mood regulation, mental clarity, work performance and the sleep cycle. Within the central nervous system, Rhodiola has demonstrated an ability to preserve levels of neurotransmitters such as serotonin, dopamine and norepinephrine. In a randomized, double-blind, placebocontrolled study examining the effects of Rhodiola on fatigue and stress, 161 patients aged 19 to 21 years received Rhodiola twice daily resulting in a significant reduction in fatigue. An additional study using Rhodiola extract in students showed significant improvements in mental performance, greater mood stability, and improved sleep patterns. Has also been identified as a strong adaptogenic botanical and is widely used in China to improve general health, support memory and endurance. In addition to its ability to improve stress resilience and fight fatigue, Eleuthero has exhibited immune supporting effects. In a double-blind study, 45 healthy volunteers received Eleuthero or placebo for 30 days. A cognitive challenge test was given to assess stress response, along with heart rate. Unlike placebo, subjects receiving Eleuthero demonstrated a 40% reduction in heart rate in response to the stressor. Eleuthero has also been shown to improve performance in runners. In a study on performance athletes, Eleuthero extract (2 or 4 mL) given 30 minutes prior to a race significantly reduced race time (48.7 minutes) compared to the control group (52.6 minutes). Native to China and parts of Russia, Skullcap root (Scutellaria baicalensis) has been used in traditional Chinese medicine for its immune supporting properties. S. baicalensis has flavanoids which provide numerous protective effects including antioxidant activity and protection against pathogens. Skullcap root has also been shown to balance inflammatory compounds and protect against free radicals that cause lipid oxidation. THIS INFORMATION COMPILED FROM ORTHO MOLECULAR PRODUCTS WEBSITE. DIRECTIONS: 2 capsules taken one to two times per day or as recommended by your health care professional. Other Ingredients: Other Ingredients: Natural Vegetable Capsules, Magnesium Stearate, Calcium Silicate, and Stearic Acid.